You spend a lot of time in meetings. On average, anywhere from 23 to 37 percent of your time is spent in meetings. If you are a scrum master or in middle management, it’s possible that you spend up to 50 percent of your time attending meetings. If you’re going to spend a large chunk of your time in meetings, you should always make sure that the meetings you plan—especially one as important as a sprint retrospective—are productive and efficient. In fact, a good sprint retrospective idea may be to discuss how many meetings the team attends, how long meetings should last, how productive those meetings are, and how you can make meetings more productive. This article includes some fun ideas that you can easily incorporate to run your sprint retrospective meeting more effectively and efficiently. What is the main purpose of a sprint retrospective? What did we do right in the previous sprint? What did we do wrong in the previous sprint? What should we start doing in the next sprint? What should we stop doing in the next sprint? Simply put, the scrum retrospective meeting lets you analyze your process in the previous sprint and create a plan for improvements in the next. Anything that affects how the team creates the product is open to scrutiny and discussion, including processes, practices, meetings, environment, and so on. All members of the scrum team—scrum master, product owner, and developers—should attend the retrospective meeting. The meeting should provide an environment where the team members feel safe to share honest feedback on what’s going well and what could be improved and to participate in a discussion of what needs to change with clearly defined action items. How do you make a sprint retrospective effective? Studies show that a major complaint of the agile methodology is the perception that there are too many meetings. Of course, for some people, one meeting per week is too many. What can you do to keep the team from thinking that a sprint retrospective is more than just another meeting? The idea is to engage your team by encouraging them to quickly identify where improvements can be made and what actions can be taken to make those improvements. For example, maybe your team has the problem of going over the 15 minutes scheduled for the daily standup meetings—you can easily fix this by making sure your meetings always start and end on time. Whatever you discuss, make sure you are inviting participation, documenting suggestions, and voting to determine which actions to take. You can create and share a Lucidchart document with the entire team to keep track of suggestions and action items. Use this template to get started. Meetings take time, and time means money. According to a 2014 report, over $25 million is wasted per day on meetings—$37 billion per year. In addition, it can take up to 20 minutes for employees to focus on their work again after an interruption such as a meeting or incoming email. Keeping your meetings short and to the point can go a long way to keeping costs down and productivity up. You’ve scheduled your sprint retrospective for one hour, but does that mean that you have to use the whole hour? It’s okay to end meetings early. Using a Lucidchart document that the whole team can access and contribute to in real time can help your meetings stay focused so you can end your meetings on time—or even a little bit early. Your retrospective meeting should not be a social gathering. Stick to your agenda to stay focused. Create a retrospective meeting agenda that can help members of your team who seem to spend more time on unrelated tangents than on topic. Meetings can be really boring, and bored team members are less likely to participate. In fact, bored employees are more likely to read email, work on other projects, or fall asleep. Regularly scheduled meetings, such as a retrospective, can become repetitive. If you see eyes glazing over and you keep getting the same answers to the same questions, you need to change things up a bit to get team members involved. You can also try to add games or other fun activities to liven up the room and get your team more excited about participating in another retrospective meeting. See the examples below. 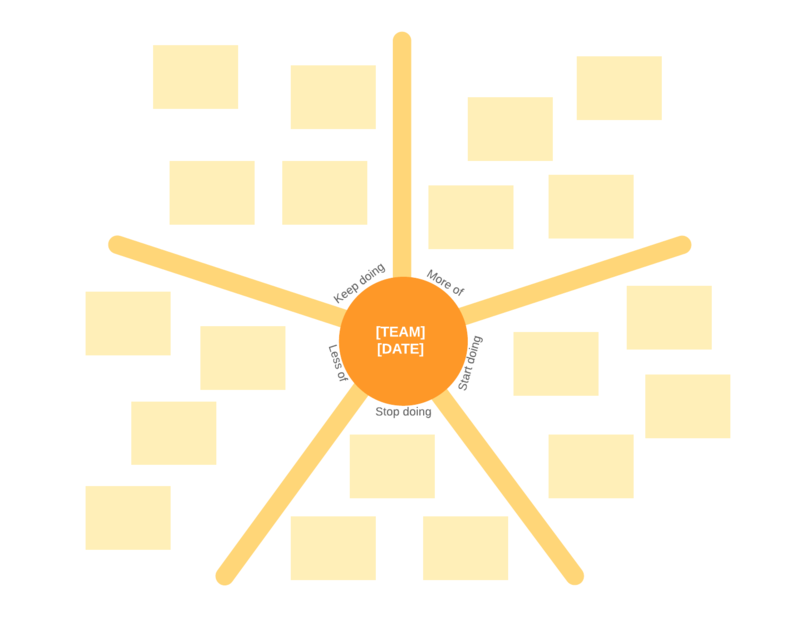 A simple way to get your team more involved is by using visuals created in Lucidchart. Many templates are available to suit your needs. Use this activity to let your team express their feelings so you can understand their emotional health. Meeting tight deadlines can cause a lot of stress and put your team under a lot of pressure. 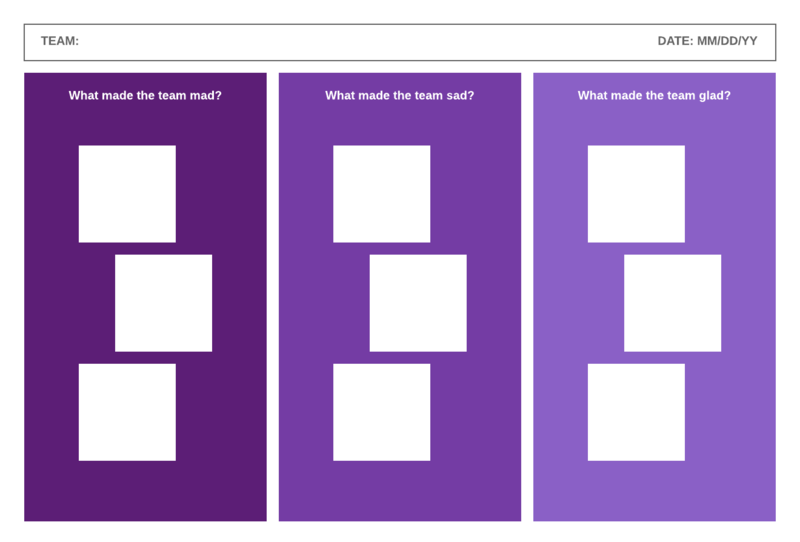 This is a good activity to help you understand the things in the previous sprint that made your team mad, what made them sad, and what made them glad. Have each team member come up with a list of what they liked or didn’t like. Use a Lucidchart document to group each observation by similarity. Then discuss and vote on which observations have the most impact. And then generate ideas and improvements that you can make for the next sprint. Stop: Activities that add no value to the team or customers. Less: Activities that have been included in the past, but do not add any overall improvements to the process. Keep: Activities that add value to the process and are already being used and don’t really need any modification or improvement. More: Activities that the team should focus on or perform more often. Start: Activities and ideas that the team believes will add value and will improve current processes. The sailboat represents the team. The island or shoreline represents the team’s vision or goal. Everything else in the drawing represents things that can help or hinder your progress (wind pushes the boat forward, the anchor slows it down, the rocks can strand or sink the boat). Using the drawing, start a brainstorming session to identify your goals, the actions that can help you achieve your goals, and the things that can hinder you. Discuss and vote on action items that will help you more efficiently achieve your goals in the next sprint. Effectively and efficiently run sprint retrospective meetings. More fully engage team members. Invite more active participation for applying new ideas and procedures. Keep the whole team on the same page. Define and achieve team goals. To learn more about how Lucidchart can help you run more effective and efficient scrum meetings, sign up for a free Lucidchart account.